Post subject: WCF WebSocket based library to enable MMO-esq Duality. I've built a WebSocket based WCF Host and a client .dll to support server based Multiplayer apps. It works with Duality (although it currently crashes the Dualitor on build/rebuild. I would love to figure out how to prevent this, Adam or anyone want to help me figure that out?). I'm happy to pass this code snippet on; It is purely prototype code to proof that a server can interact with a Duality-based client and will need re-engineering to fit anyone's purposes. I started by designing a WCF WebSocket Service and a .dll Class Library for the client. 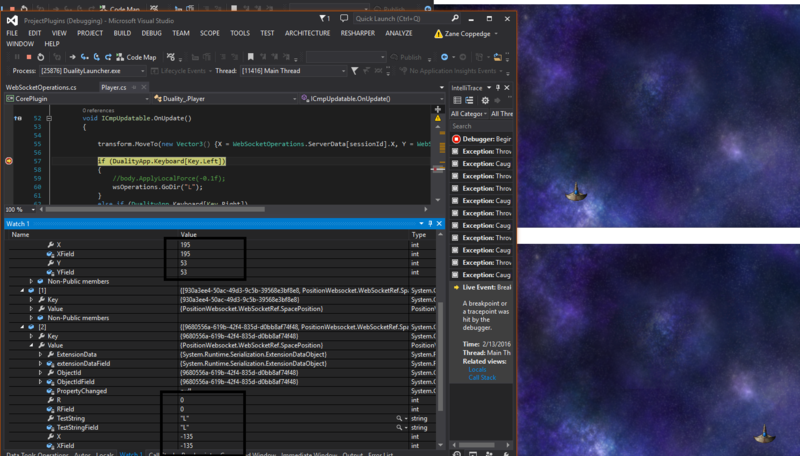 I was going to use Unity as a front end for a MMO Space Role-Playing-Shooter (top down) but Xamarin based stuff didn't play well with my .dll and I hated the idea of being stuck in something less than .net 4. I stumbled across Duality and it took a very short time to get this up and going. The service was running on localhost (ws://localhost:port/PositionService.aspx); I hung the service on Azure as a cloudapp with a few extra clicks to make sure it was really passing web traffic. 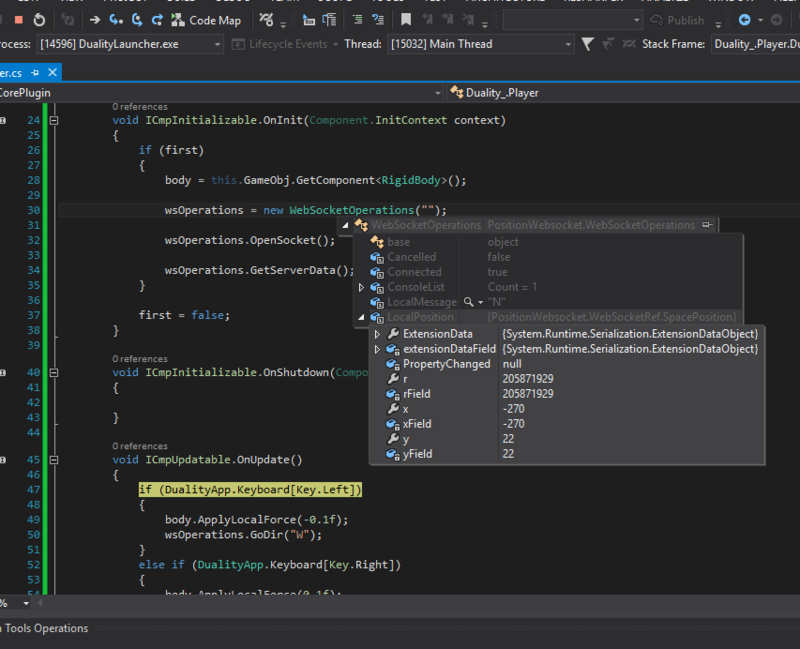 I built the basic Duality Getting Started tutorial, shoehorned the .dll in and got it running! The X and Y in this image were NOT generated on the client, but on the webhost and passed to the client. This is very primitive but can be expanded greatly to support server based multiplayer or MMO style gameplay. Server side logic will need to be implemented, making the Duality client a fairly 'dumb' client that renders server data and transmits control input to the server. This could be blended to give the client more logic control but you loose security when the client is trusted more. // These will be implemented on the Client. <add type="Microsoft.WindowsAzure.Diagnostics.DiagnosticMonitorTraceListener, Microsoft.WindowsAzure.Diagnostics, Version=2.7.0.0, Culture=neutral, PublicKeyToken=31bf3856ad364e35"
//Specify the address to be used for the client. // have an error on client.Close where the async server data arrives after closure, causing .net to freak out. TODO: fix this. 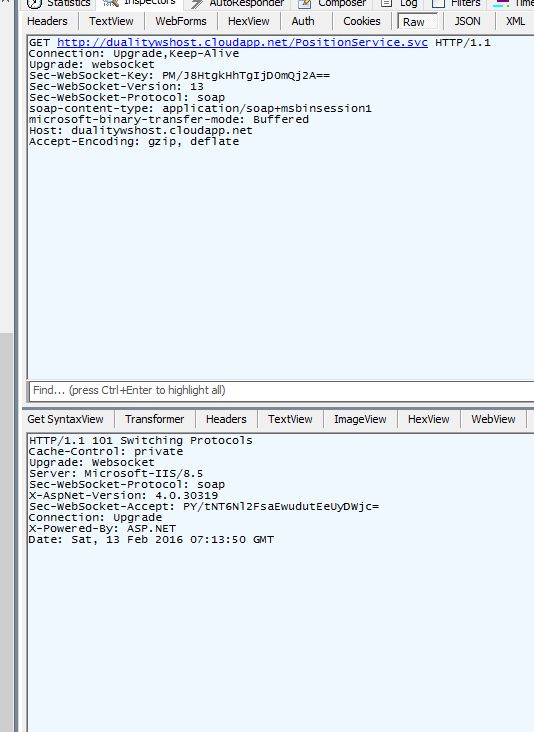 // Here is the implementation for the Interface we built on the WCF host. - You will need to add a Service Reference to your service so VS will generate all of the clientside code to match the host. Drop your .dll in the C:/Duality directory or wherever appropriate. Add it to your references. Last edited by zanco on 2016/02/13, 19:04, edited 2 times in total. This is nice! Do you have any gif/video of the example running, or even a link for us to download the modified getting started app? I'd love to see it working! [Core] ERR: Error writing object: XmlException: The ':' character, hexadecimal value 0x3A, cannot be included in a name. A plugin reload at runtime consists of saving all data, clearing plugin-related caches, removing the old plugin, loading the new version of the plugin and then loading all data again. The error happens in the saving step, from what I can tell by the logs. In order to find out what exactly is causing the serialization error, we'll have to find out what's the object that cannot be serialized. Did you do implement any custom serialization methods? Did you implement any custom DualityAppData or DualityUserData classes, or add a tag to any of them? Did you implement any custom Resources? Can you reproduce the same error when saving your test Scene? If yes, what objects are in there? Does the error occur anywhere else, or at any other times? For reference, this might be one of the last lines in Duality code before running into the error - though it seems like Release mode optimizations skew the picture a bit. It seems you're initializing WebSocketOperations every time as a runtime-only object. It also seems like that object contains references to other objects that are definitely not meant to be serialized. If you add a [DontSerialize] property before the wsOperations field, does that by any chance fix the error? And some progress! It's important to note that since I'm using the Getting Started tutorial, all of the .OnUpdate code is ran in the Player object. This needs to be translated to a Game Controller object of some sort so it can render all of the objects in the world. For now I just drive my player around and ignore all of the other players in game (but the data to position them is passed to the client successfully! // entity Guid is kept to translate their provided session ID to their entity Guid. // TODO: translate all Session IDs to Guids appropriately, ensuring that input only provides Session IDs and output only provides entity Guids. // TODO: figure out the right settings for this Service Behavior. // reach out to the DB or whatever to get the approrpiate spawn positon for injection into the world. // // maybe we submit the chat message to logging here??? if we do, we do it async to not lock up the thread with a non-essential DB write. If you add a [DontSerialize] property before the wsOperations field, does that by any chance fix the error? Works like a charm in sandbox and VS Start now, build/rebuild doesn't crash Dualitor! Thanks! Nice work you've done here! I'm looking forward to seeing it evolve over time. It's a first step to getting working multiplayer in Duality. Since the server will be the brain, I either need to figure out how to port dualitys libraries to the server to do collision detection calculations which has its own challenges or I need to find another solution (build or find a find a library to do physics...). To fit a true MMO model, an authentication service will need to be designed as well as a Web frontend for acct creation. This will need a DB, which I'm looking at Azure tables for att. The server is a WCF service so will need to be dynamic, loading scene content and maybe running multiple scenes under low load as well as having the ability to push scenes (and it's clients) to a different service. Finally, an extended set of methods needs to be added to the wcf server code to allow administratI've functions and monitoring. This will require a master client app to controlled all of the Web services. A second interface and service pair will be built for these administration methods, which can be left out as the client .dll service reference is generated and added as parent classes when the admin .dll is generated. That should keep malicious clients from being exposed to the administrative methods... the Administrative sessions with the server will be what spawns the logic/physics threads on the server, allowing all of the calculations to be ran from memory on the wcf service in Azure instead of interact with a DB where a webrole or webjob would apply the logic/physics. This will prevent a huge bottleneck and be very cheap to run on the cloud... a DB will be needed for saving status for crash recovery, transferring to another service on warp or service handover as well as inventory and pulling rendering (sprite and other) data for objects in game. Also this will require the client to have a game controller class instead of a player class that will decipher the server data and render the changes to objects in the world. Handling dynamic player character creation will require nearly naked prefabs where server tells the client the sprites for the player characters. Some sort of HUD with a chat feature will need to be designed (the server and client code for chat is super easy...). A menu system will also need to be grafted in. The choice to stay space bound or to build some sort of in-dock walk around needs to be made; that's starting to sound like feature creep. I'll make a burn down list soon.